The second King (DLG-10) was laid down 1 March 1957 by Puget Sound Naval Shipyard launched 6 December 1958 sponsored by Mrs. Oliver W. Vandenberg daughter of Fleet Admiral King; and commissioned 17 November 1960 Comdr. Melvin E Bustard in command. After shakedown along the coast and in Hawaiian waters King continued training out of San Diego for the remainder of 1961. Following extensive preparations the guided-missile frigate sailed on her first WestPac cruise 7 June 1962 strengt hening the mighty 7th Fleet with her Terrier missile arsenal. Operating with this mighty peacekeeping force King helped to check Communist aggression in Southeast Asia. Upon returning San Diego 31 December she resumed tactical exercises off the West Coast until 1 August 1963 when she departed on her second WestPac cruise. Once again her operations with the 7th Fleet helped maintain stability in the Far East. King returned San Diego 10 March 1964 and conducted operations along the coast for the rest of the year constantly perfecting her fighting skills and increasing the peacekeeping ability of the Navy. King headed back for the Far East 5 April 1965 escorting Oriskany (CVA 34). She operated from the South China Sea during May screening carriers and participating in air-sea rescue work. She continued to serve off Vietnam until returning to S an Diego 2 November. 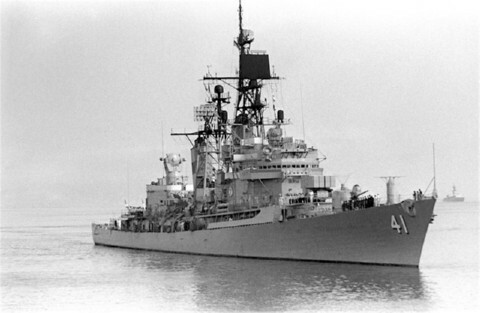 The guided missile frigate operated off the West Coast until heading back for the Western Pacific 26 May 1966. On this cruise she carried a helicopter for search and rescue missions to save American pilots during strikes against North Vietnam. She arrived Da Nang South Vietnam 27 June. During July she saved five downed aviators including one who was rescued from deep within North Vietnam by the ship's daring helicopter crew. In August the ship was stationed in a positive identification and radar adviso ry zone (PIRAZ) in the Gulf of Tonkin to help protect American ships from enemy aircraft. Before she was relieved she had checked over 15 000 aircraft. During this duty she also rescued seven pilots whose planes had gone down during strikes against enemy targets. She continued this duty except for brief runs to Hong Kong and Subic Bay until relieved by Long Beach (CGN-9) on 29 November. King returned to San Diego 20 December and operated off the West Coast into 1967 preparing for future action.